So, it’s that time of year again, when we’re thinking about the twelve months just gone, now passing into memory, and wondering about the next twelve, still amorphous and misty on the horizon. 2014 has been a year of ups and downs for me, but one thing I’m proud of is this blog, and I’m really grateful for all the interaction and fun (not to mention friends) which have come my way as a result of writing it. Here’s how Clockwatching… did over the past year – and all of it is down to those who read and enjoy what I write here, and who keep (bless you!) coming back for more. Happy New Year, everyone. Let’s hope 2015 is bright, happy and filled with peace, for all of us. This entry was posted in Musings, Writing News and tagged 2014 in Review, benefits of writing a blog, blogging, Happy New Year, how has my blog performed over the past year, writing a blog on December 30, 2014 by SJ O'Hart. To those who celebrate – Happy Christmas. To those who celebrate and those who don’t, I wish you all peace and happiness, and the joy of a life well lived. I would like to say ‘thanks’ for reading this blog throughout the past year, for leaving comments and likes, for engaging with what I have to say and for supporting me on my writing journey. I hope to have lots more news and milestones to share in 2015, and I hope you’ll all be there with me, every step of the way. This entry was posted in Musings and tagged Christmas, Frankie Goes to Hollywood, Happy Christmas, peace and happiness, The Power of Love, The Power of Love music video on December 24, 2014 by SJ O'Hart. This will, more than likely, be my final book review of 2014. It’s wonderful, then, that we’re finishing things on such a high note. 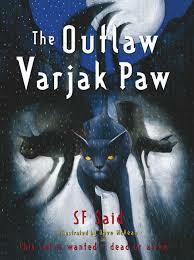 For this week, it’s the turn of The Outlaw Varjak Paw, by S.F. Said. You might remember me reviewing the first book in the Varjak Paw sequence here, and how much I loved that story, too; I can safely say that Outlaw, the sequel, consolidated and deepened my love for this brave, plucky, loyal little cat and his band of followers. It’s almost enough to make me a fan of cats in real life, and that’s no mean feat. The Outlaw Varjak Paw picks up Varjak’s story shortly after the events of the first novel. He has been fully adopted by the city cats Holly and Tam, and their steadfast dog companion, Cludge, has become a vital part of their gang. As the book opens, they are heading to the city dump to search for food, for the city is locked in a cold winter and there is nothing to eat. Sally Bones’ cats have begun to extend their ‘zones’, grasping at control and dominance that isn’t theirs to claim, and meting out fierce and dreadful punishments on any cat who dares to cross them. The traditional hunting grounds and ‘free zones’ have now become no-go areas – unless you want to face the legendary wrath of Sally Bones, of course. So what’s a cat to do when Sally Bones, the most fearsome cat in the city, is on your tail because she knows you have the same power she does, or a version of it at least – access to the Way of Jalal, the secret fighting techniques that render a cat unstoppable in battle? Varjak has been taught the Way by his ancestor Jalal, but he knows that somehow Sally knows the Way, too, and is far stronger and more accomplished than he is. The terrorised cats of the city, living in fear of Sally Bones, begin to turn to Varjak as a saviour – but is he ready to carry that burden? When Sally Bones’ cats take a prisoner from among Varjak’s new friends, a young kitten named Jess, he knows he has no choice. He must risk certain death by going right into the heart of Sally Bones’ territory to do the impossible, which is to reclaim a hostage; everyone knows that once Sally Bones has you, you’re never seen again, but Varjak has no choice. Jess and her family defied Sally Bones because they believed in him, and they have paid a terrible price. He’s not about to let them down. His journey to Sally Bones’ lair leads him through terrifying tunnels where he encounters both strange cats and dogs he must learn to trust, and into the darkest ‘night of the soul’ possible, when he fears he has forgotten the Way completely. Can he fight not only his enemies, but also the darkness and terror which sap his strength and self-belief – and can he make the city safe for all his friends, feline and canine alike? Well. This book is beautiful. Not only because of Dave McKean’s amazing line-drawings, similar to the ones he did for Varjak Paw, but because of the lyrical language and clear description and settings which are easily imagined (made extra delicious by the fact that there are no people in this very built, urban environment), and by the depth of psychology and complexity which Said brings to the character of Varjak Paw, and the animals with which he shares his story. The ‘lessons’ Varjak learns as he lives out his adventure are emotionally affecting, and the highs and lows of his quest are so gripping that they definitely carried this very human reader along. I loved all the characters, particularly Sally Bones who is, most definitely, one of the most effectively chilling and creepy villains I’ve ever had the (dis)pleasure of reading; her ice-blue eye will haunt my dreams, I fear. Of course I loved Varjak, and his brave Holly, and the sparky Jess, and the immensely courageous Mrs Moggs, and the unstintingly loyal Cludge (who has, let’s face it, simply the best name of any literary dog. Ever). I’m not sure who I’d recommend this book to. It’s a wonderful story for readers of eight or nine onwards, but there is quite a lot of fighting, and in every battle scene at least one valiant combatant loses blood. There’s description of claws and slashing and injury, but I’m sure it’s not too much for even the most sensitive of readers, though parents may want to read it first just to make sure. This is a book which should appeal hugely to its target middle grade market, but which will keep readers of any age enthralled and invested in its defiant, justice-loving characters. Varjak Paw is definitely settled as one of my all-time literary favourites, and I’m sure I’ll revisit his tale many times. Happy Christmas, everyone, and all best wishes for the start of a brand new year. S.F. Said’s new book, Phoenix, has been gathering rave reviews. Check it out here. This entry was posted in Book Reviews and tagged beautifully illustrated books, books with animal characters, Cludge, Dave McKean, Holly, S.F. Said, Tam, The Outlaw Varjak Paw, Varjak Paw on December 20, 2014 by SJ O'Hart. 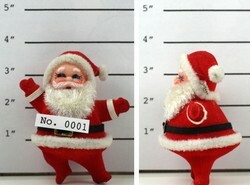 Wanted: Santa Claus. CC artwork by Kevin Dooley. Freddie’d be the first to admit he’d been an amateur, in the beginning. Trying to stay awake all through Christmas night? He couldn’t believe he’d ever tried that. Not for real. Half the kids in the world tried that old ruse. Eleven o’clock would come, Christmas Eve, and it’d be like someone pulled the shutters down. Freddie had long suspected foul magic. He’d sleep like a log till well after Old Red-Suit had been and gone, and the presents left behind would seem like an insult. Try again next time, little man, they’d chuckle. Try better. Well, this year, it was on. He’d planned it for months. Titanium-core netting over the fireplace? Check. Steel bolts to seal off the chimney? Check. A hyper-sensitive pressure trigger on a brain-rattling alarm? Check. Freddie settled back with a cookie, smiling. This year, he vowed. 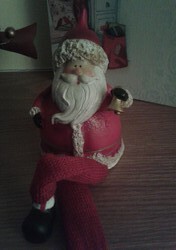 This year, Mr Claus, I’ll be the judge of who’s naughty, and who’s nice. Capisce? Ho Ho… Ho? So, this week the story prompt on Flash Friday was a captive Santa. Something a lot of kids have dreamed about, I’m sure – certainly, I was one of those oh-so-nosy types who couldn’t just leave Santa Claus alone to carry out his very important work, but who had to try to figure out how it was all done – but I never went to the lengths Freddie has gone to. I’m not sure what’ll happen next in this terrible tale of woe, but I sure hope Santa escapes, because I get the feeling Freddie’s not the type who enjoys sharing… imagine if one kid, one mini-megalomaniac, had control of Santa’s power? The chaos! This entry was posted in Writing News and tagged capturing Santa Claus, Christmas Eve, flash fiction, flash fiction about Santa Claus, Flash! Friday, Flash! Friday microfiction, image prompts in fiction, Old Saint Nick, Saint Nick, Santa, Santa Claus, using image prompts in flash fiction on December 19, 2014 by SJ O'Hart. This year has been a good one, reading-wise. Anyone who follows my book reviews (hi, Mum!) will be aware I try to read at least one book a week (usually it’s more than that), and this year I re-read a lot of my old favourites. I had a bit of an Alan Garner-fest, which is never a bad thing, and I revisited A Wrinkle in Time, which was definitely overdue. But, of course, there were some books which stuck out from the rest, and to which I feel I should pay a little homage, now that we’re at the end of the year. My goodness! What a dreadful noise. Anyway. Let’s carry on, shall we? Of course, I read more books for children and young adults than the average person, and so I’ve divided up my list of ‘Bests’ to reflect that. I’ll take the books I read for adults first, just because. Most Beautiful Book (for Adults) read this year: The Strange and Beautiful Sorrows of Ava Lavender, by Leslye Walton. Now, this book was marketed (and I bought it) as a YA story, but I really don’t think it is, actually. I think Ava Lavender is quite definitely a grown-up fairytale about love and loss and mortality, with a beautiful magical-realist feel and a wondrous style all of its own. Plus, that cover. It’s the most beautiful thing, particularly in ‘the flesh’. I urge you to go out to your local bookshop/store/purveyor and just pick up a copy and stroke it. If you don’t want to buy it after that, I despair of you. Favourite Historical Novel for Adults read this year: Burial Rites, by Hannah Kent. A masterful retelling of the last execution to take place in Iceland, this is a gripping, semi-fictionalised tale which lingered in my mind for weeks. Best SF/Fantasy Novel for Adults read this year: The Girl with All the Gifts, by M. R. Carey. Chilling, meditative, profound, loving, terrifying and moving – all at the same time – this book took me by surprise. I didn’t expect to love it as much as I did. Best Literary Fiction of the year: A tie between Donna Tartt’s The Goldfinch and Sarah Waters’ The Paying Guests. Two very different books, written by two exceptional authors, I loved both of them (except, perhaps, for the very end of Goldfinch). Books like these make me glad to be a reader. Top Idea for a Christmas Gift (or an ‘any time of the year’ gift): Beyond the Stars, edited by Sarah Webb. Twelve amazing stories, all illustrated, and all written by children’s authors at the top of their game, this book is a real treasure. I hope it will feature in many little Christmas stockings this holiday season. Best YA book read this year: Without a doubt, Louise O’Neill’s stunning début Only Ever Yours. This book left me an emotional wreck, in all the best ways. It’s not only an incredibly accomplished piece of work, but an important story. It needs to be read. I can’t recommend it any more highly. (Also high on this list are Half Bad and The Witch of Salt and Storm, both of which I loved and I’m delighted to have discovered their authors). Best historical-themed children’s book read this year: This one was a closely drawn contest between Frances Hardinge’s Cuckoo Song and Emma Carroll’s Frost Hollow Hall. I honestly loved them both, but Hardinge just shades it, for me. That’s more to do with the fact that I adore Frances Hardinge in all her incarnations than a criticism of Frost Hollow Hall, which is an amazing book, wonderfully well written. I heartily recommend it. Both these books showed me, as if I needed it proved, that the world of children’s writing is a wide and wondrous one. Most beautifully written children’s book read this year: Rooftoppers, by Katherine Rundell. I had some tiny quibbles with the plotting in this book, but one thing I can’t fault is the author’s use of language. The book is written so perfectly, with every word judged just right, that it left me in awe. Favourite ‘classic’ children’s book read this year: Journey to the River Sea, by Eva Ibbotson. As I said in the review I wrote for this book, I can’t quite believe it took me so long to get around to reading Eva Ibbotson, but now that I have, I don’t intend to stop. This is a marvellous book, and would make a beautiful, and treasured, gift. Most beautiful book of the year: Most beautiful in terms of its production, and its illustrations, and the feel of it in my hand, and the heft of it as an object, was Sally Gardner’s Tinder, illustrated by the incomparable David Roberts. I wasn’t as enamoured with the story as I was with the drawings, but that still hasn’t knocked this book off its top slot as ‘most beautiful’. It truly is a work of art. My favourite book of the year is The Skull in the Wood, by Sandra Greaves. It was one of the first books I reviewed this year, and I said even then that it would be hard to beat. It wasn’t, of course, published in 2014 but it’s still a ‘new’ book, and if you’re looking for a decently scary, magic-tinged, emotional and exhilarating story, look no further than this book. I loved it. So, there you have it – the best of what I read in 2014, all totted up for your viewin’ pleasure. I hope, if you’re looking for some bookish gifts, that this list is useful, but even if you’re just looking for suggestions for your next great read (or you’re merely a statistician, coolly collecting votes and numbers), I hope you’ve enjoyed this post. Happy Read-mas! 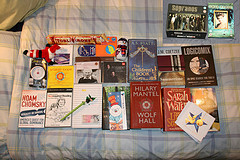 This entry was posted in Book Reviews, Musings and tagged best books of 2014, Best books of the year, book recommendations, give books as Christmas gifts, my favourite reads this year on December 18, 2014 by SJ O'Hart. He was a small, scattered-looking man, maybe fifty, out of place here in this brash, chromed diner. His clothes looked older than he was, hair so dirty it seemed painted on, but I noticed him mainly because his eyes never lifted and his hands – dark and thin and quick – never stopped moving. As I watched, he pulled a measuring tape out of his top pocket, and used it to take the width and height of the shelves near the register. He shook his head, muttering, as he replaced the tape and fished out a tiny black-covered notebook, wrapped around with a rubber band; then, he found a pencil behind one grimy ear and used it to make a note. Replacing pencil, band and book took only a blink, and then he was off once more, measuring the booths, the register, the width of each floor tile. The staff worked around him, and the customers – regulars – never blinked. ‘What’s going on with the little guy?’ I asked the waitress when she brought my order. She concentrated on placing my dishes down before answering. ‘Mm?’ The coffee was as good as their sign outside had promised. The waitress would’ve made the trip worthwhile all by herself, come to that. ‘No kids?’ She didn’t answer, but her eyes softened, and I knew. I threw her a hint of a wink and she smiled, a tiny pink point of tongue slipping out between her fine white teeth. Then, she was gone, and all I had to look at was Walter. Curious, I got up, coffee in hand. Slipping into a booth, I was close enough now to smell the man. No reply. Walter didn’t even pause in his work. Measuring, noting, checking, comparing. ‘Walter,’ I said, louder. ‘Hey! What’s up with the tape?’ He flinched, but he didn’t look at me. I could see his eyes hopping like mayflies on a pond. ‘Who’s ‘she’, Walter?’ I asked, watching him fumble for his notebook. ‘Listen, I heard about your wife -‘ I began, thinking I understood. Before I could reply, he dropped his gaze and kept on going. This entry was posted in Writing News and tagged flash fiction, measuring tape, stories about a missing child, stories set in diners, supernatural flash fiction, supernatural short stories, Thomas Hawk, using image prompts in flash fiction, Walter on December 17, 2014 by SJ O'Hart. I’ve been having a right old job, this year, of levering myself into some semblance of Christmas spirit. This lovely blog post, over here, is packed full of tips on how to get your bells jingling and your wee three kings Orient-ing, or whatever, and so yesterday evening I had a chance to put some of those tips to the test. Namely: the house got decorated to within an inch of its life. Seriously. There’s tinsel everywhere. First, of course, we had to take care of our Santa Claus-es. Doesn’t he look relaxed? Almost like he’s saying ‘Hey, you guys. I should’ve been sitting here for, like, two weeks already?’ Better late than never, little Santa. Better late than never. Fmff! Whut? Is it Christmas again already? I can’t see out through this beard! 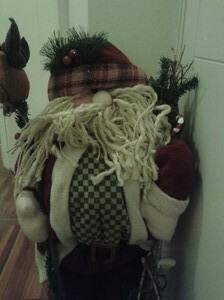 Every time someone walks past this guy, he jingles – just a little, but enough to let you know he’s watching you. Which isn’t at all creepy. What do you mean, ‘that’s not a Christmas tree’? Of course it is! 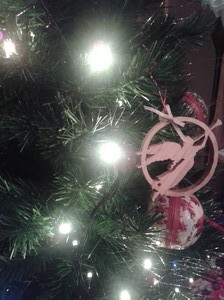 Branches, and a star on top, and… stuff hanging off the branches! 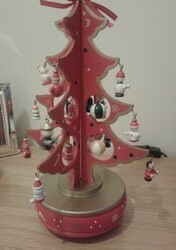 It even spins, and plays a Christmas carol as it goes! All right. *sigh* I should’ve known I couldn’t fool you guys. We also put up our small (but perfectly formed) crib, and some more little touches, like a sweet little chorister figurine which sits on our TV table. I then did my usual ‘twisting tinsel through the banisters’ nonsense, which looks like a troupe of cabaret artists have just passed through – but dangit, it’s undeniably festive. I like to remember the real ‘reason for the Season’, too, and this beautiful angel decoration, made by a craftsman in the town where I grew up, is my way of doing that. I love this decoration, and another one in a similar style showing the Virgin and Child, which is on the other side of our Christmas tree. So, we’re fully dec(k)ed out now. Yay! 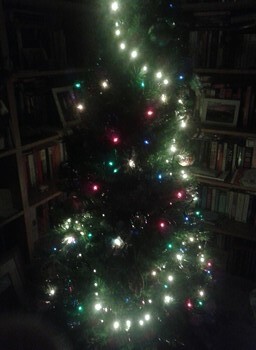 I’m still feeling a little bah-humbuggy, but I hope that seeing our lovely tree every time I go into the living room (even if it is rather in the way of my bookshelves, hmph!) will lift my spirits a bit. I hope you’ve been getting into the swing of things, if you and/or your family celebrate Christmas, and that your houses would leave mine in the shade when it comes to the fabulousness of your decorations. It does, undeniably, make the whole place seem a bit livelier, so if – like me – you’re feeling curmudgeonly this year, try fancying up your living space a little, and see if it helps. Happy decorating! And hope you all have lovely Christmases. This entry was posted in Musings and tagged Christmas, Christmas decorations, Christmas rituals, Christmas tree, decorating your house for Christmas, Emmanuel, favourite Christmas decorations, putting up a Christmas tree, the reason for the Season, why decorate your house for Christmas on December 16, 2014 by SJ O'Hart.